Diegesis in The Wicker Man. Some of the music assessed in the last section raised further questions besides their thematic and narrative content. Though this element was an important part of the analysis, another aspect almost appeared to be ignored; that of the diegesis of such performances. For a horror film, The Wicker Man presents the viewer with new diegetic possibilities, using techniques so far removed from the hyper-realism of horror that it’s surprising the film works with their inclusion. However, the analysis of the diegesis will show that that this is just more subtle acknowledgment of the Folk Horror Chain. As stated, Giovanni’s score had already, quite deliberately, blurred lines between the roles of diegetic and nondiegetic. In the scenes about to be discussed, Giovanni himself is seen playing the instruments and singing one of the songs, further raising questions around the strange sound relationships. Fitzgerald and Haywood suggest that this aesthetic ambiguity was more to do with presenting the crumbling psychological state of the main character arguing “Through the careful privileged orchestration of event and sound around the protagonist, this and subsequent scenes represent Howie as entrapped in a world where reality and illusion blur, stretching sanity.” (p.107, 2009). This is a somewhat convenient reading which avoids the overall complexities of the score. While some moments in the songs composed for the film do, or at least can, act as nondiegetc scoring, others are far more complex in their relationship with the narrative reality and the viewer’s reception. Let us return to the example of Willow’s Song which is by far the most obvious and interesting moment where this aural ambiguity occurs. As Willow’s aim is to try and seduce Howie, she sleeps in the room next to his. He is staying in the island’s pub run by Willow’s father (hence the rather strange but logically sound interlude of the song, The Landlord’s Daughter) and is trying to get to sleep after the shock of his initial findings on the island. The song opens with a simple acoustic guitar melody and some form of percussive hit before any of the vocals enter[i]. As the rooms are above the pub where the majority of the islanders go at night, some are sat with musical instruments as predetermined by the earlier performance of The Landlord’s Daughter. Though Willow’s Song is mixed on a nondiegetic level (with sound levels being of an obvious recorded variety), Hardy opts to show the performance as if it has the same potential in the reality of the film. Perhaps this blurring is to give the space of the pub the lived in “feel” as Gorbman believes as being one of the main functions of diegetic music, writing “Diegetic music fleshes out film space, and variables in recording, mixing, and volume levels further determine the quality, the “feel,” or framed/lived space in a given film.” (p.25, 1987). While the introduction of the song occurs, visuals of the islanders in the pub playing along to the music are actually shown to be the source of the music. This is then cut to upstairs where the character of Willow supposedly sings the song through the wall to Howie in an attempt to seduce him. When discussing film sound, Chion argues that “These distinctions only have meaning from a geographical, topological, and spatial perspective, analogous to zones among which one finds many shadings, degrees, and ambiguities.” (p.75, 1994). 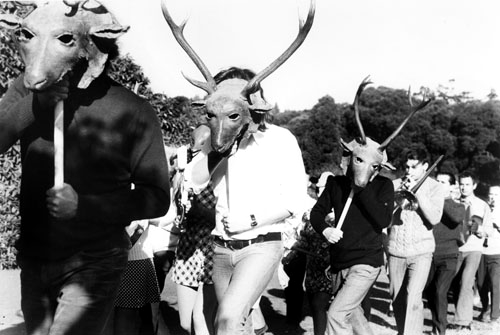 The Wicker Man is one of the first horror films to question these various zones through music. “As socially and historically produced, the categories of the live and the recorded are defined in a mutually exclusive relationship, in that a notion of the live is premised on the absence of recording and the defining fact of the recorded is the absence of the live.” (p.89, 1992). By mixing the two without regard for this symbiosis, The Wicker Man could risk losing its effect as horrific piece of cinematic pulp. As Willow’s Song progresses, the cuts between the supposed different sources of the sound become more overt as in a music video; the narrative logic of the scenario being sacrificed for attaining an overall audio-visual effect and experience. Wurtzler goes further when discussing these ideas in the form of musicals, posing the question “But is such a potential conflict between a spectator hailed by the image and an audit or differently positioned by the sound such a threat to the cinema’s subject effect?” (p.98, 1992). In the case of The Wicker Man, the answer is a clear, resounding no. This is an apt creative ploy in the folk horror genre for a number of reasons. The first is its reinforcement of the idea of the island community as a type of gestalt. When Howie awakes the next day, he’s not entirely sure what happened the night before as if the music had put him in some sort of trance. “Film music has distinct connections with ritual and religious music; indeed, it might even be argued that one branch of film music’s genealogy derives obliquely from this quarter.” (p.37, 2005) states Donnelly and these songs present a succinct interpretation of this argument. Perhaps some of the songs in The Wicker Man are indeed meant to be seen as having some sort of ancient power and the illogical audio-visual relationship with which the songs are presented are meant to suggest this power and the special interconnectivity between the close-knit community. Other songs within the film also back this up, especially those surrounding the important cultural ceremonial events rather than the scene-setting songs. In Hardy’s original cut of the film, the song Gently Johnny is given the same treatment and aesthetically resembles a music video, at least in Mundy’s definition; “Precisely because it is rooted in musical performance, music video privileges specific visual performance in much the same way that numbers in the Hollywood musical, filmed Soundies clips, or segments of Oh Boy! and other television shows do.” (p.242, 1999). Hardy was furious at the cutting of this scene, its thematic contextualising of the film of clear importance and merit. The scene almost plays as a pairing to the scene of Willow’s Song, where the islanders are appearing to be encouraging a young boy into a similar scenario with Willow, the song implying obviously that he needs less encouragement than our prudish, conservative policeman. It also hints at this potential power of the music, as if the people at the centre of the action lose their will and become entranced by it. The other reason why this type of audio-visual technique sits well within the sub-genre as a whole is because, being such a multimedia amalgamation of ideas, putting emphasis on other types of media ahead of the narrative logic of the host medium reflects the interests of the counter-culture movement. This isn’t to say that the film is deliberately surreal but the lack of rigid adherence to the film’s primary focus suggests a similar ideology to the culture that surrounded the films themselves; that of free-thinking. It also doesn’t present the two opposing forces as simplified as Pratt argues suggesting that “Perhaps they’d twigged an important point: The Wicker Man was not a simplistic film which depicted counter-culture free spirits as heroes and uptight authorities as fools.” (p.30, 2013). As we will see however, this ideology could be essentially shattered, not just by moving the film narratives back to the past, but, by adding other elements of the Folk Horror Chain; dark forces and the supernatural who show their presence through unusually musical and aural methods. [i] This is again played by Giovanni, though whether this relationship has any genuine effect on the film is yet to be seen as it implies knowledge on the part of the viewer as to the appearance of the composer. A Musicological Study of Ken Russell’s Composer Films – Part 1 (Introduction).